How does one live with crippling circumstances when God does not change them? Do you know someone living with unrelenting pain? I do. At times does it seem like they are drowning? Or their life is in flames? Have you begged God to ease their pain, to take it away? I have. Did God answer your prayer? God did not answer mine. The Apostle Paul pled with God to change his circumstances and God said, "My grace is sufficient for you." I wonder if Paul audibly heard God’s voice. Or was he meditating on God's promises? Perhaps this promise that God made to Israel helped Paul understand the adequacy of God’s presence: When you pass through deep waters, I will be with you. When God does not answer my prayer for someone who is suffering, I find comfort in that promise, knowing that God’s grace, that is, his presence, is sufficient even during times of chronic, crippling, unrelenting pain. In her book "A Place of Healing, Wrestling with the Mysteries of Suffering, Pain and God's Sovereignty" Joni Eareckson Tada describes her journey with pain. I wrote Deep Waters after reading Joni’s book. The song is a music story interweaving God’s promise and a journey with pain. A few weeks after writing the song I had emergency surgery, was in a hospital bed, alone, in isolation, in pain, unable to sleep, and struggling to breathe. I was in deep waters. And Deep Waters became my song. From the album “This & That – A Little Bit of Everything” this video is scrolling playback of the song. 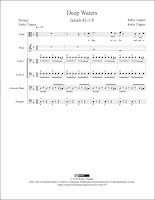 You can get print (PDF) and/or digital (MusicXML™) sheet music for Deep Waters. Beautiful and haunting music. At age 70 I'm learning piano, which makes appreciate your artful work. I'm delighted that you are learning to play the piano.